Beginning December 18th, travelers will be able to take high-speed Frecciarossa trains straight from Rome’s airport to destinations across Italy. 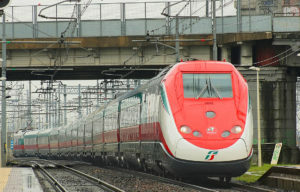 The Frecciarossa trains will connect Fiumicino Airport with Florence, Venice, Pisa, La Spezia and Genoa. Currently, travelers have to go into Rome’s city center to pick up a train to these cities at either the Termini or Tiburtina rail stations, on the opposite side of Rome from the airport. Ferrovie dello Stato Italiane, the Italian state railway company, plans to launch similar services with the Frecciarossa trains to and from Milan’s Malpensa Airport in 2019. The agency’s director, Gianfranco Battisti, said the plan was to create a “great integrated transport network” that will link the country’s airports, train stations, and ports. Frecciarossa is also expanding existing rail services, including between Milan and Venice, and between Florence, Rome and Naples. More high-speed trains will run between Rome and Milan, including an early-morning route that arrives in Milan by 8:30 a.m., and weekend service between Rome and Bari will be expanded to include additional trains and a nonstop route that takes just three and a half hours. Further, the company will add a new direct route from Turin to Lecce.